I am pleased to be a part of Kristen Duke’s Decorating with Pictures series this year! The focus of the series is to encourage people to decorate their homes with actual photographs of their loved ones. Artwork and architecture are wonderful, but nothing beats a great photo of a family member. While we do have an entire gallery wall of photos in our front entryway, I don’t have a ton of family photos in our living room. 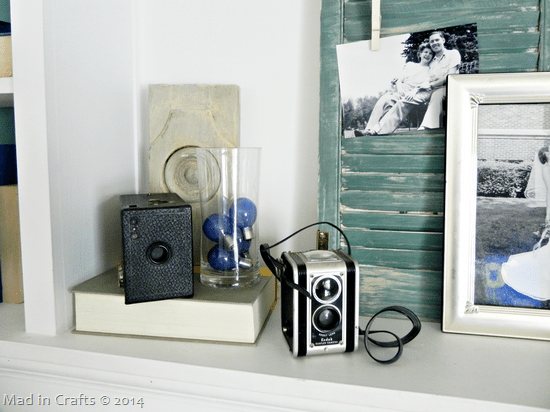 As a part of this Decorating with Photos series, I decided to remedy that by creating a mantel display that would feature some of my favorite photos – those of my husband’s and my parents and grandparents as young couples. It ended up being a perfect mantel to have up over Valentine’s Day, even though I don’t usually decorate specially for that holiday. 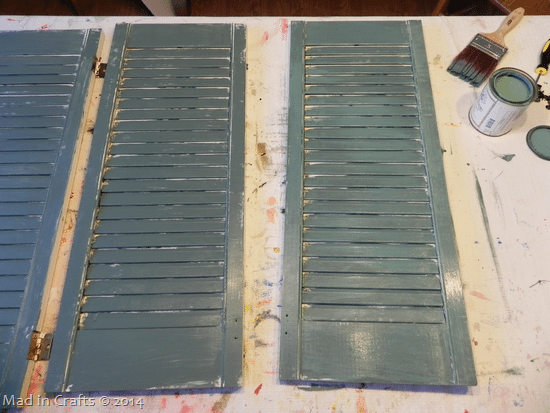 I started with these plantation shutters that I removed from my son’s bedroom when we moved into The Mad House. They didn’t fit at all with his new space themed bedroom, but I wasn’t about to just throw them away. When I began to dream up this mantel design, I knew that they would work well as a backdrop for the photos. However, since the photos were black and white, and because there was some water damage to the shutters from being stored in our garage, I needed to paint them. 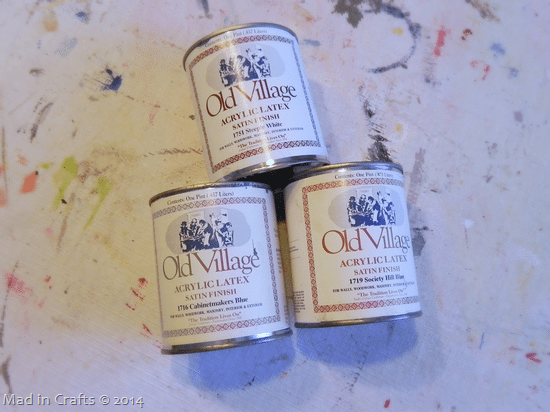 I was finally able to try out the samples of Old Village paint that the company sent to me last Fall. This really is terrific paint. I will write up more about it in another post, I promise! To achieve a rustic, vintage look, I layered on three different colors of paint: Cabinetmakers Blue, Society Hill Blue, and Steeple White. I purposefully did a slipshod job of brushing on the coats of paint. I wanted the original white shutters to show through, and I wanted the shutters to look weathered. 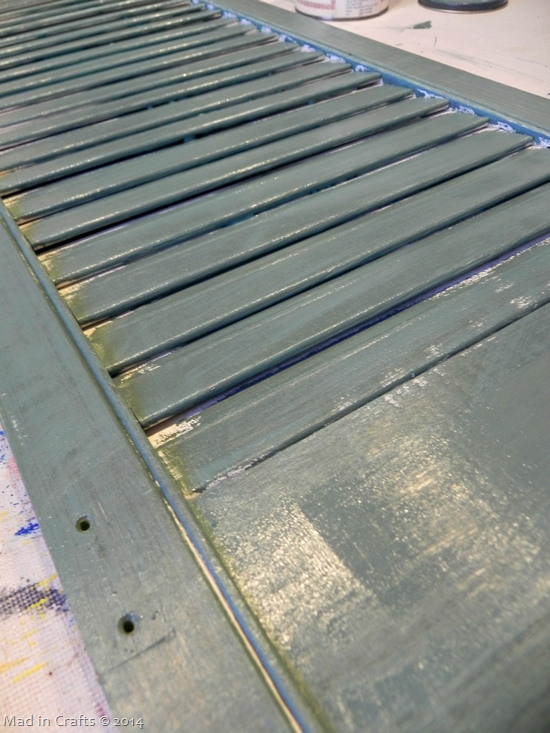 Even before the first coat of Cabinetmakers Blue was dry, I quickly brushed on a very light coat of Society Hill Blue. You can just barely see the variation in color in the picture above. 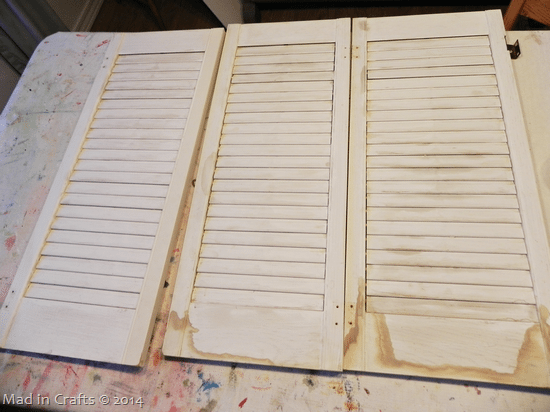 Finally, I swiped on a few passes of Steeple White, and then wiped the shutters down with paper towel to blend the paint and remove excess color. Then I left the shutters to dry. Once the paint had dried, I was ready to set up my mantel. I originally printed the photos out 7 1/2 years ago for our wedding reception. While I love looking at professional wedding photos too, I just love the that these photos are relaxed snapshots. Their faces are so genuinely happy. 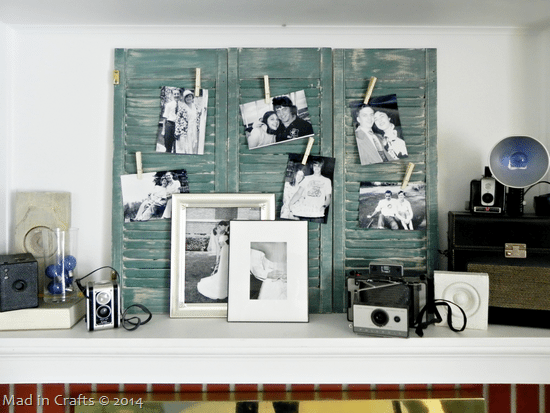 I used raw wood clothespins to pin the photos to the slats of the shutters. 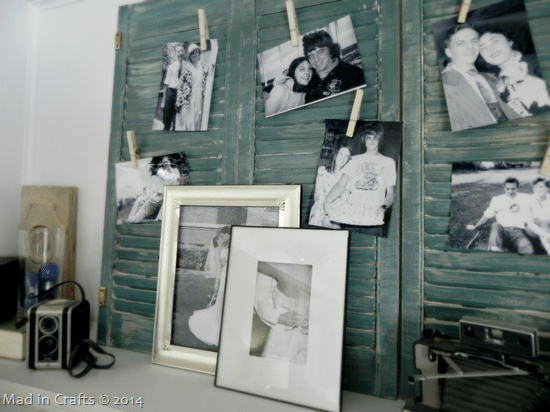 I leaned two of my favorite photos from our wedding up against the shutters as well. I think the blue-green shutters draw attention to all the photos nicely. 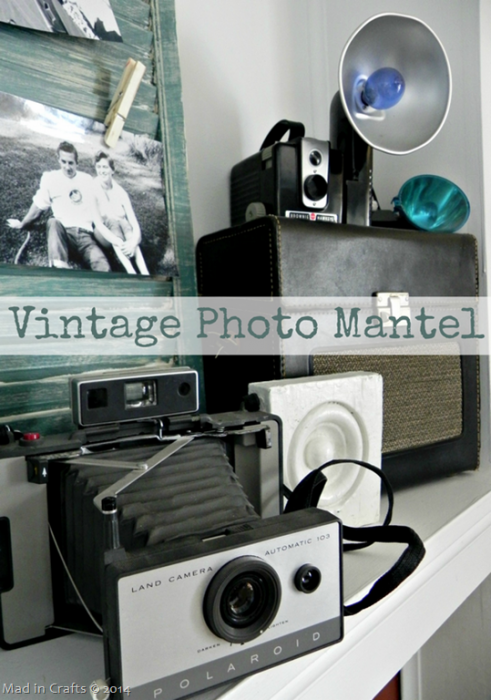 I used the photo-centric mantel theme as a chance to display my vintage cameras. I found these two cameras at a local thrift store as part of a half-off sale last year. The glass vase holds pretty, blue vintage flash bulbs. These two cameras, and the leather case, belonged to my grandfather. Yes, the same grandfather whose camera tripod I eventually turned into a floor lamp for our living room! This is one of my favorite mantels that I’ve put up in The Mad House so it may stay up for awhile! 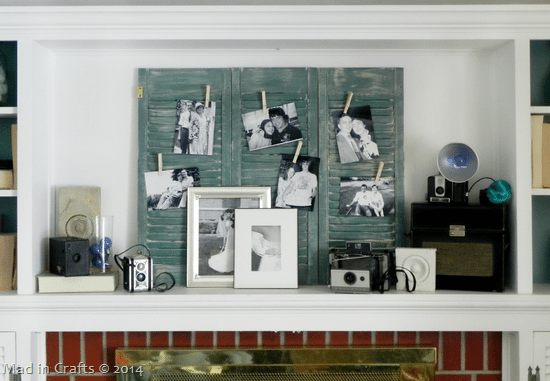 If you would like to see how other bloggers are decorating with family photos, be sure to pay a visit to the Decorating with Pictures archives on Capturing Joy. 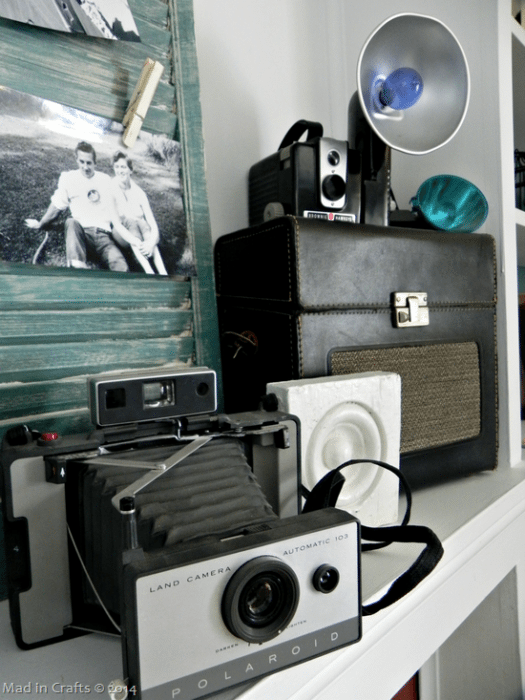 You are sure to find ideas to inspire you to show off some smiling faces in your own home. 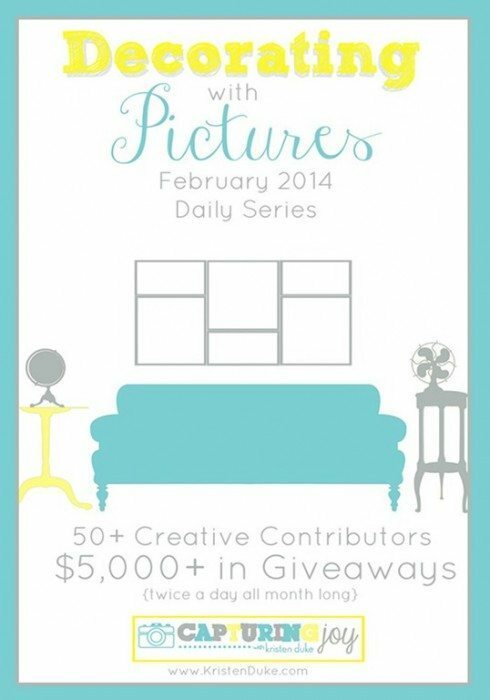 Make sure to also enter to win today’s giveaways in the Decorating with Pictures series! Great job reconditioning these shutters! They look awesome. You are very creative. Reconditioning these shutters are great. I really love the cabinetmakers blue color.